Beginning 14 February, the geo TLD .BERLIN enters Sunrise phase allowing trademark holders to register their .BERLIN domain names. The 30-day Sunrise period for the German capital’s own domain .BERLIN commenced on 14 February. Trademark holders who have registered their trademark in the Trademark Clearinghouse (TMCH) can enjoy preferential registration during the Sunrise phase. The TMCH’s central trademark database has been established for the protection of brands under new gTLDs. With over 1000 new domains coming to the Internet, the TMCH has been set up to allow trademark holders a single point from which they can submit and protect their intellectual property. Brand owners are informed, if in the first three months after launch of .BERLIN domain a third party registers a brand identical to their domain names. 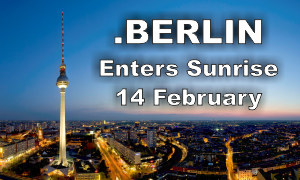 Upon conclusion of the Sunrise phase, .BERLIN will enter the General Availability phase that will allow Berliners to register their desired domain names under the new extension. For more information about the .BERLIN domain, contact our Support Team at support@web-soultions.eu or via phone on +44 (0) 208 133 3994. Further, Web Solutions offer Managed TMCH Services. We will streamline the process of collecting, submitting and managing submissions to the TMCH, securing that all associated SMD files are included and managed.